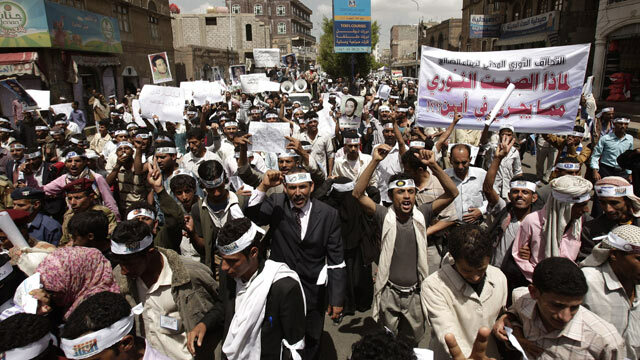 Yemeni members of the Peaceful Revolution Salvation Front chant slogans during a demonstration demanding independence of the judicial system from government control, in Sanaa, Yemen, April 23, 2012. Yemen has confirmed that a top member of al Qaeda in the Arabian Peninsula was killed in a weekend airstrike that U.S. officials say was conducted by the CIA, another sign that the U.S. drone campaign in Yemen is gaining momentum. A statement released by the Embassy of Yemen in Washington, D.C., said that Mohammed Al-Umda was killed by an airstrike on Sunday. The strike targeted the SUV he was riding in as part of a "militant convoy" in a remote desert region of southern Yemen. He was among three individuals killed in the attack. The embassy statement does not identify who conducted the airstrike, but U.S. officials say the airstrike was conducted by a CIA drone. Both the CIA and the U.S. military's Joint Special Operations Command (JSOC) fly Predator drones over Yemen targeting al Qaeda in the Arabian Peninsula (AQAP) operatives. Al-Umda is described in the Yemeni Embassy statement as one of AQAP's "top commanders, tasked with providing logistical and financial support" and as having commanded a number of AQAP's military operations in Yemen. He is described in the embassy statement as having been "ranked 4th on Yemen's most wanted list." According to the website The Long War Journal, which tracks U.S. drone strikes in Yemen, the U.S. has carried out at least six airstrikes in Yemen in the month of April, for a total of 13 so far this year. This year's totals have already surpassed the 10 conducted all of last year in Yemen. Though counter-terrorism ties between the United States and Yemen's government have continued to be strong, U.S. counter-terror training was suspended last May during the long popular uprising against Yemeni president Ali Saleh. A U.S. official said the training was suspended because the units American military trainers had been assisting were being used by the government in military operations. Following a year of violent protests, Saleh officially stepped down at the end of February. The Washington Post reported last week that the CIA is now seeking to expand its drone targeting program over Yemen beyond targeted "personality" strikes to include "signature" strikes that target patterns of suspicious behavior by terrorism suspects. Officials with knowledge of the request told the paper that the White House has still not decided whether to approve the request. Al-Umda was convicted and imprisoned for his role in the bombing attack in 2003 of the French oil tanker Limburg in the Gulf of Aden. He was one of the 23 suspected or convicted al Qaeda members who in February, 2006 tunneled their way out of the Yemeni prison in which they were being held.